Israeli settlers attacked Palestinians farmers near Huwwara on Saturday 11th October. More than 25 settlers from the illegal Israeli settlement of Yizhar descended upon Palestinian farmers while the farmers were undertaking their annual olive harvest. 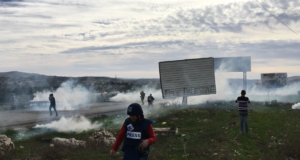 The settlers were armed with machine guns, and one fired a single shot in the air before they began to hurl rocks at the Palestinian farmers, injuring two. One of the injured, Mustafa Najah from Burin, was hit in the head and taken to Rafidia Hospital in Nablus. He is thought to have sustained eye injuries. 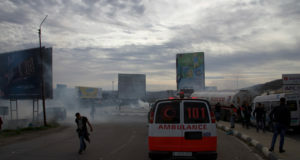 The attack continued for ten minutes before Israeli soldiers arrived on the scene. The soldiers, however, instead of removing the settlers from the land, started to fire into the air, insisting that the Palestinian farmers cease their harvesting and leave the lands. Farmers report that the soldiers and settlers then walked around the groves together, telling farmers to leave their own lands. The farmers were forced from their lands for over an hour, before eventually being allowed back to continue their harvest. 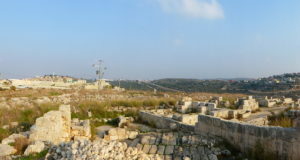 Settlers continued to maintain a menacing presence on the hilltop overlooking the olive groves throughout the afternoon, kept at bay only by the presence of the Israeli army, who, after their initial rampage, took on the protective duties by which they are legally bound. The farmers were also joined by Israeli and international activists, who will continue to maintain a presence with the farmers until their harvest is complete. The farmers, however, expressed concern about the well-being of their olive trees overnight, after arriving at their lands to find more than 15 olive trees had been cut down by settlers in the preceding days. Lying in the shadow of Yizhar, the olive groves had been unattended by farmers since ploughing was done in May, as this area is considered extremely dangerous.